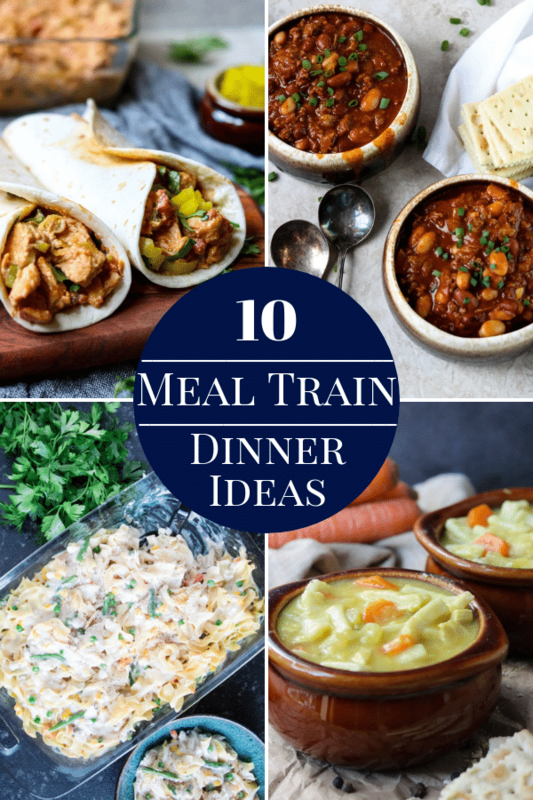 A dinner that everyone will love? Yes! 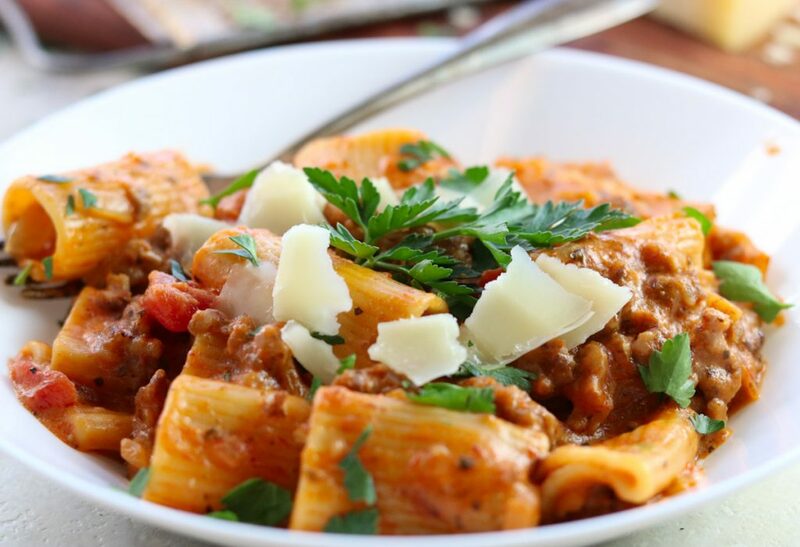 Instant Pot Sausage Rigatoni with Tomato Cream Sauce fits that bill. It is a big yummy pot of carbolicious pasta, Italian sausage, garlic, onions, and spices, all mixed with a heavenly tomato sauce with just a touch of cream. I love using my Instant Pot to make pasta! There’s no boiling water, stirring, waiting, straining. It all gets mixed together and cooked in one pot. Not to mention you only have one pot to clean at the end. Once that liquid is mixed with a little heavy cream it thickens up just a smidge and turns into the most delicious velvety sauce. Let it rest in the pot for just a few minutes and it will coat the pasta perfectly. If you have a piece of bread you will be sopping up that sauce to the very last bite. If you don’t have bread you will be tempted to lick your plate. Go for it! Choose your own sausage flavor – hot, mild, or sweet – pork, turkey, or chicken sausage. Stir in some fresh grated Parmesan cheese at the end for a cheesier version of this pasta. Top each serving with a dollop of ricotta cheese. Garnish with fresh chopped basil, chives, or parsley. 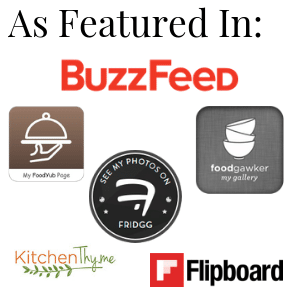 Use your families favorite jarred marinara. Since this is such an easy dinner I like to keep it all pretty simple and give myself a break. I will just warm some thick bread in the oven, like a ciabatta or baguette, and make our favorite bagged Caesar salad. 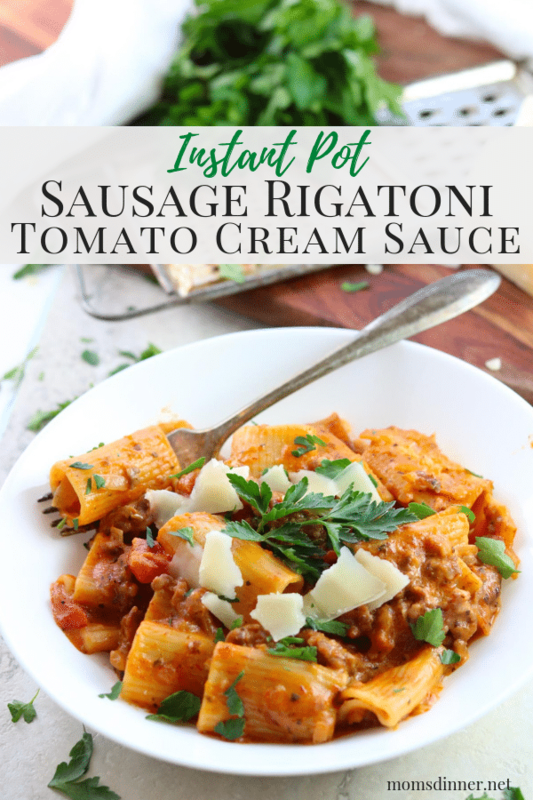 I hope you give Instant Pot Sausage Rigatoni with Tomato Cream Sauce a try in your kitchen. 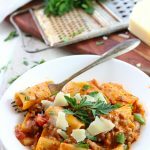 Save the Instant Pot Sausage Rigatoni with Tomato Cream Sauce recipe for later. Pin it here. 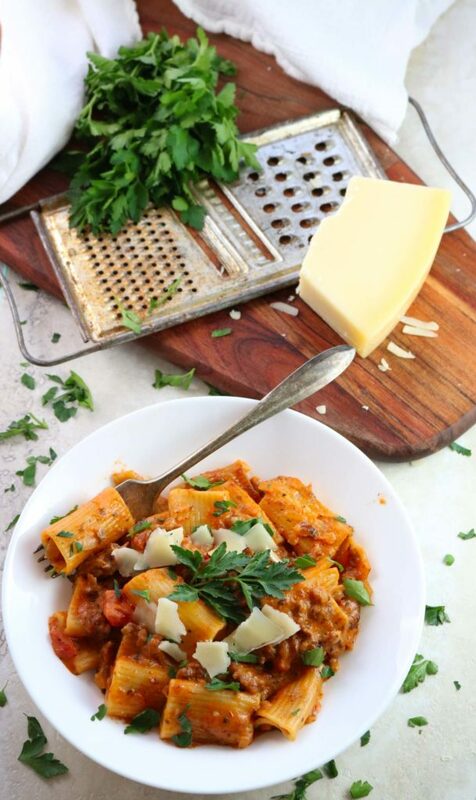 A rigatoni pasta mixed with sausage and a rich marinara sauce with just a touch of cream. 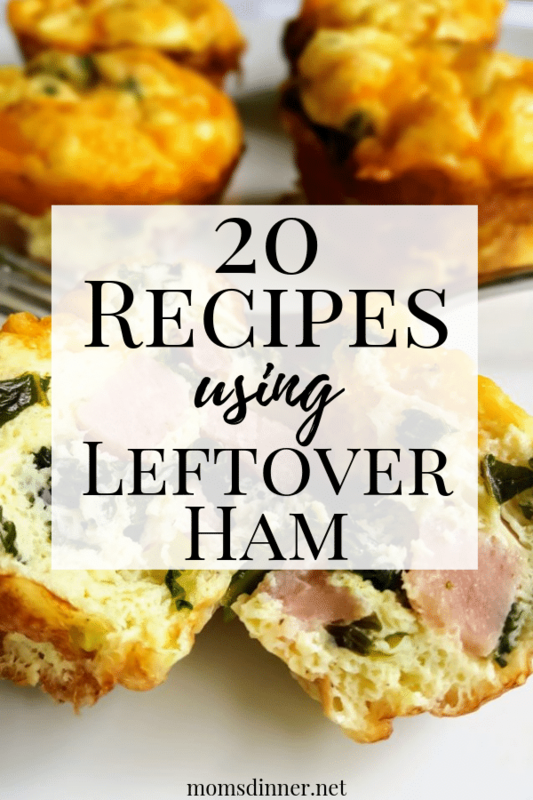 Easily made all in your Instant Pot. This is an excellent one pot dinner. Set the Instant Pot to saute. Cook the onions and garlic in the oil until the onions are translucent, about 5 minutes. Add the oregano, basil, garlic powder, red pepper flakes, and sausage and cook, crumbling the sausage until it is cooked thru, about 5 minutes. Turn the saute mode off. If there is excess grease from the sausage, drain some off before moving on. Add the pasta, water, sauce, pesto and salt. Stir to combine. Try to have all the pasta at least touching the liquid. Lock the lid in place and turn the pressure valve to seal. Using pressure mode set the timer for 7 minutes. When the timer beeps, turn the pot off and do a quick release by turning the pressure valve to vent. Once all the pressure is released remove the lid. There will be a little liquid left in the pot. Pour in the heavy cream and stir to combine. Let it rest for a few minutes, it will thicken as it sits. 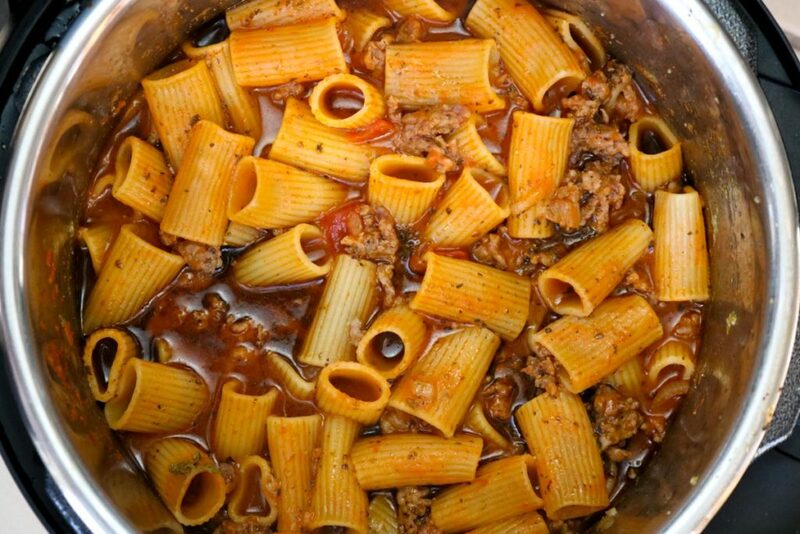 * It is normal to have a few pieces of pasta stick to the bottom of the pan. It will just require extra scrubbing when you wash the pot! 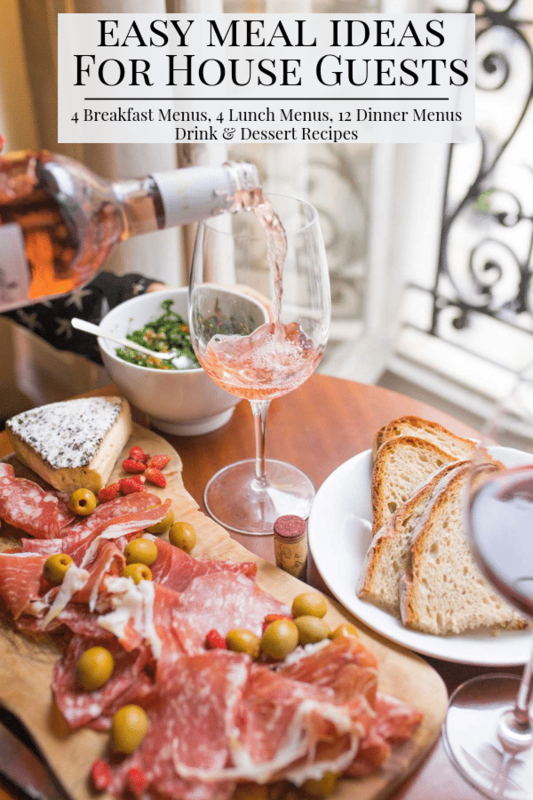 This recipe makes my mouth water just thinking about it! Yum! I made this tonight and it was wonderful! Love how simple and quick it was after a long day. Thank you for providing this! I am so glad you loved it! I hope you put your feet up while it cooked.